AJ Styles and Randy Orton have been in conflict for weeks, but their issues may be resolved in a show-stealing match on the Grandest Stage of Them All. The Phenomenal One issued a challenge to The Viper for WrestleMania 35, which will be their second singles match thus far. Orton came out about 30 minutes into SmackDown Live, but was interrupted by Styles who addressed his sneak attack at the Fastlane pay-per-view. The former WWE Champions traded several verbal jabs with Orton saying he built the WWE and didn't need Styles' indy pals while Styles said Orton always needed someone to help him throughout his career and that Orton had to use his connections to get to WWE, unlike Styles' colleagues. 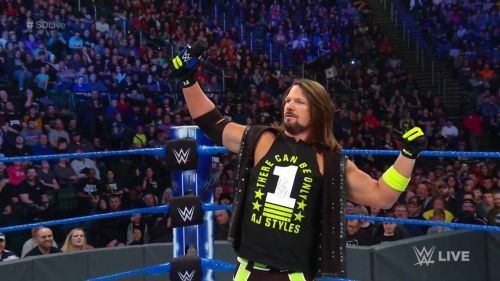 Styles would call out Orton for a match at WrestleMania 35 to the delight of the thousands in attendance, but The Apex Predator left the ring before confirming the match. A pay-per-view match between Styles and Orton has been considered a dream match by many wrestling fans who were left unsatisfied by their initial encounter in 2017, heading into WrestleMania 33. Orton would win their first match and go on to defeat Bray Wyatt for the WWE Championship while Styles wrestled Shane McMahon in the opening match of the show. Neither man would cross paths again until the Feb. 12, 2019 episode of SmackDown Live when the Elimination Chamber match participants competed in a gauntlet match. Styles defeated Kofi Kingston towards the end of the gauntlet, but was hit with an RKO out of nowhere by Orton who won the gauntlet. Styles would also be defeated by Orton in the Elimination Chamber match when he was hit with another RKO. The match hasn't not been made official for WrestleMania 35, but this highly-anticipated match will be confirmed soon. It goes without saying that both men are great wrestlers and they will be expected to give us a match of the night contender at MetLife Stadium.